The UNI70/HC-OS with kit moving arm, is an accurate and powerful bending machine able to bend large diameters pipes as well as thin and delicate ones. The optimal and constant bending radii do not deform bent pipes: it is the ideal machine to satisfy every user’s exigency in the plumbing, nautical, hydraulic, industry and plants’ installation in general, above all in the ornamental field. 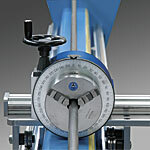 - Computerized hydraulic system for the closing and opening of locking and bending tools. 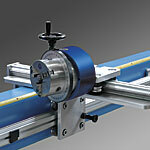 With two additional interchangeable outlet shafts for bending without mandrel. Close-up view of the kit moving arm for bending with mandrel. Close-up view of the kit moving arm for bending without mandrel.